I have a bit of an obsession with glass. I love the feel and weight of glass so much that I have an entire set of mismatched glass dishes, bowls and plates in my cupboards. Every time I see pretty clear glass dishware on sale, I buy six or eight bowls or plates, knowing that they’ll work well with the rest of my collection. While I was working on designs for a doodled faces art journaling class, doodling was on my mind. I seemed to see doodles everywhere I went! 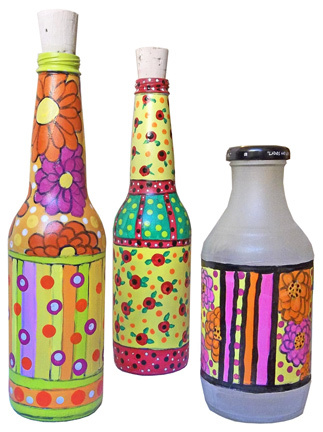 When saw a picture of some pretty painted bottles online, the two ideas sort of collided with my endless collection of glass bottles saved from the kitchen: why couldn’t I just doodle on that glass, then paint my designs, and end up with my own pretty, painted, upcycled creations? 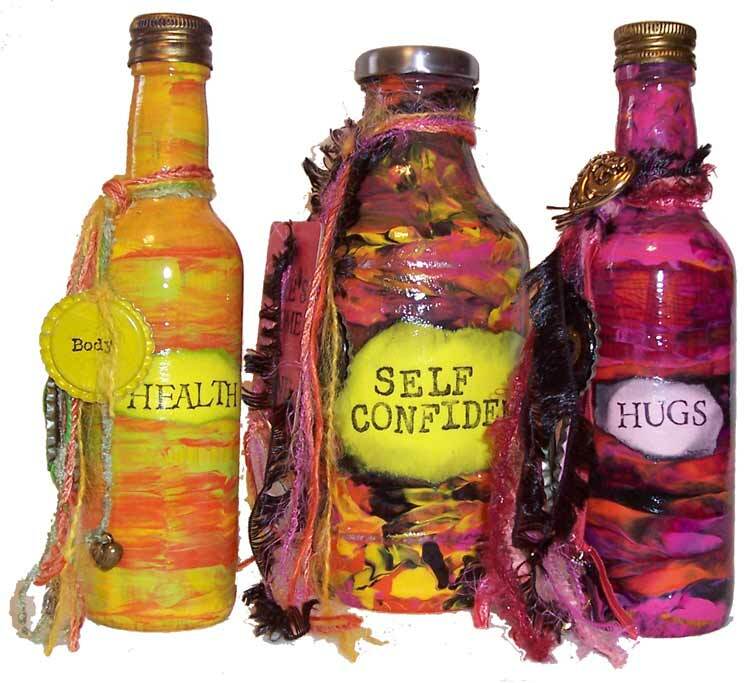 That’s exactly what I did to create these colorful patterned bottles. Glass is a remarkably easy surface to paint upon, once it’s been properly prepared. 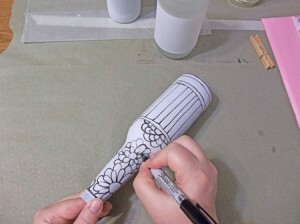 In this lesson, we’ll prep them in two ways: with frosted glass spray, and with plain old spray primer. Both sprays will give the glass a little bit of texture, to better grab the paint, and keep it from sliding around the way it would if the surface was left bare. Glass bottles. 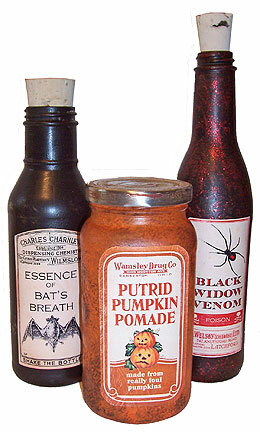 I used two small brown beer bottles, and a clear barbeque sauce bottle. 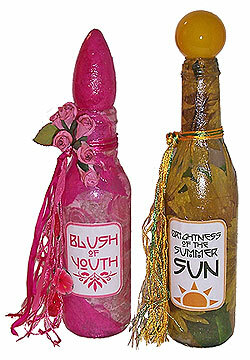 Look for bottles that are smooth, rather than ridged or embossed. Frosted glass spray. I’m not entirely sure you need this, but since I couldn’t find a spray primer for glass, I used this as an undercoat, to make sure everything else stayed on the bottle. It certainly made painting easier than when the glass was left bare. White spray primer. This is spray paint. It’s primer. And it’s white. Don’t get white spray paint. Get white spray primer. Primer is designed to help the next layer grab onto the surface, while paint is designed to repel anything that’s put over it. Sharpies, or your favorite permanent markers. I like Sharpies, because you can clean them up with rubbing alcohol. Cheap acrylic paint. Don’t use the good stuff. This technique really requires the cheap paints to work. 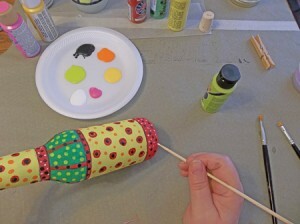 Pencils with erasers, bamboo skewers, or other round things to use as circle stamps. Clear sealer. I used Diamond Glaze. 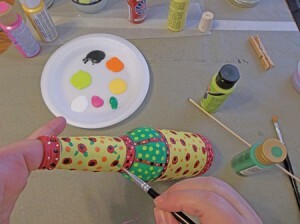 Corks to fit your bottles, if you don’t have or don’t love the lids. 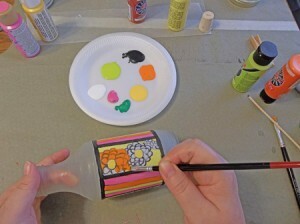 Masking tape, if you want to mask portions of a bottle. Start by spraying the with frosted glass spray. Just a light coat of spray will do. Do this in a well-ventilated area. 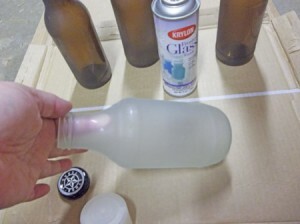 On some clear bottles, I masked the top and bottom with masking tape after applying the frosted glass spray, so those sections would remain transparent. 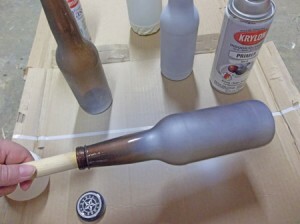 Spray the colored bottles, and the unmasked areas of the clear glass, with white primer. Do a couple of light coats on darker glass. One coat will do it on clear glass. 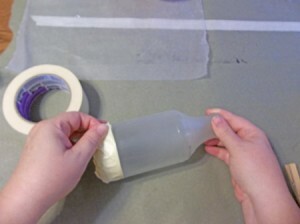 If you’ve masked any areas with tape, remove it after spraying, before the paint dries. Doodle! 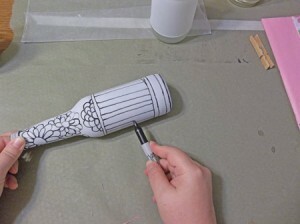 Use a Sharpie to draw all over the bottles. I do a lot of flowers with round centers, and rounded petals, but you may do what you like. Everyone doodles differently. 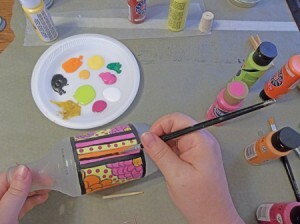 While you’re doodling, think about how you might apply paint to add color. Leave some open areas to paint. Think about what colors you might use, and start lining them up as you doodle, to develop a palette. 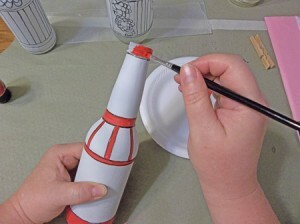 To draw straight lines around the bottle, lean your hand on your work surface, hold the pen steady, and rotate the bottle. 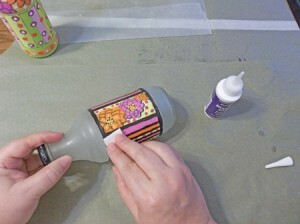 To draw vertical lines up and down the bottle, lean your hand on your work surface, and lay the bottle on its side. Slide the bottle across the pen. Paint! I usually pick three or four colors, and paint all of one color, then all of the next. Don’t worry about painting over the Sharpie. It will show right through the cheap acrylics. To make large dots of the same size, I use the eraser of a big pencil. I piece of wood dowel will also work. 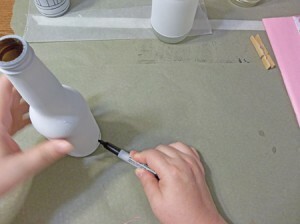 For smaller dots, I use the flat end of a bamboo skewer as an applicator. For really tiny ones, I use the pointy end. To turn some of my large dots into flowers, I added leaves made by simply pressing a small flat brush against the bottle, and pushing the end closest to the flower a little harder. It makes a shape that’s rounded, and tapers to a point. Try to paint stripes using a flat brush that’s slightly smaller than the stripe width. 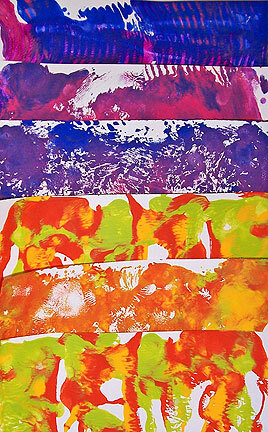 Load the brush with enough paint so that you can paint in one long stroke. 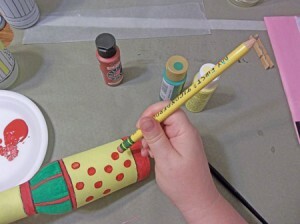 If you wish, after the paint has dried, you may darken the black lines back in with Sharpie or black paint. 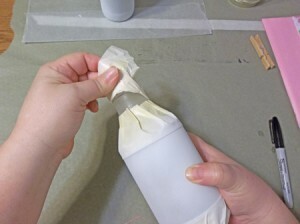 When the bottles are dry, seal with your favorite sealer. I used a bit of Diamond Glaze, and a foam makeup sponge as an applicator. The foam seems to leave fewer streaks than a brush.